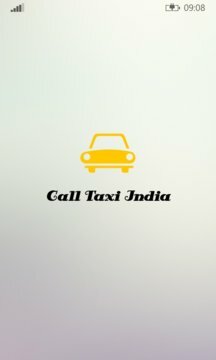 Call Taxi India - One stop solution for calculating taxi fare in real time. It's a handy app to book a taxi without searching for their phone numbers. It also has feature to estimate fare before you set to go. Built with SOS functionality to notify people when you are in emergency. Know taxi speed with Speedometer. Get directions to nearby Cinemas, Mall, Restaurants, Banks, etc. with nearby feature. Designed to satisfy end user experience while traveling in call taxi. 2. Fast App Resume makes user to engage with multitasking. 3. 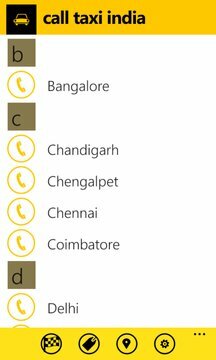 Support for Large and Transparent Live Tile (WP 8.1). 4. Background Location Tracking, the travel experience just got better. 1. When the user begins his/her journey, just press 'live taxi' app icon. 2. Tap 'Start' to begin journey when you get in to taxi. 3. Switch to Day/Night map modes easily. 4. Click 'Night Fare' icon to get fares accordingly. 5. Orange colored marker will guide you through the journey. 6. Just tap the marker, it will pop up your current location details. 1. SOS feature in Call Taxi India will allow you to notify others if you are in emergency. 2. Configure up to 3 mobile numbers in 'settings'. 3. When you are in emergency, while travelling, just tap 'SOS' icon to notify via Facebook, SMS and Call. 4. For posting in Facebook, Activate Text Messaging using your mobile number. You have an option to post via Internet too (WP 8). 5. You also have the advantage of sharing your location via share charm in WP 8.1. 1. Now you can estimate travel distance, time and fare before you set to go. 2. Type your Source and Destination and click 'search' icon. 3. It will guide you to choose your location. 4. Now, tap 'Get Fare' icon, to know your fare, total distance and estimated travel time. Get directions to nearby Cinemas, Mall, Restaurants, Banks, etc.